Hello Everyone, today I am participating with Fusion Card Challenge. On my card I have used the sketch only this time around. I simply cut the striped patterned paper with a circle die and adhere a white panel behind which were distress with Crushed Olive distress ink. The pear die-cuts were watercolored and adhere on the middle of the card. The sentiment "We Make A Great Pear" is from the Wplus9 Punny Produce: Pears. Elegantly done Joni! Just beautiful!! Wonderful ! loved the freshness yellow brings into this card ! Love it! Such a great color combo, and a really fabulous graphic, eye catching design! Love, Love your card! Ha, ha, great sentiment too. I've GOT to try this too!! I've never colored diecuts before, but seeing your artwork..... wow. Love the pear diestacked like that! Wonderful watercoloring and I love the pears on the black and white stripe. Your card is so elegant .Loved your watercoloring what a beautiful card this is !!! Those water colored pears are absolutely yummy Joni! Amazing and ethereal. Love. So glad you play FUSION Joni!!!!!!!!!!!!!!!!!!! Beautiful card. I so want that stamp set. My wish list is getting a little bit much because of your cards. 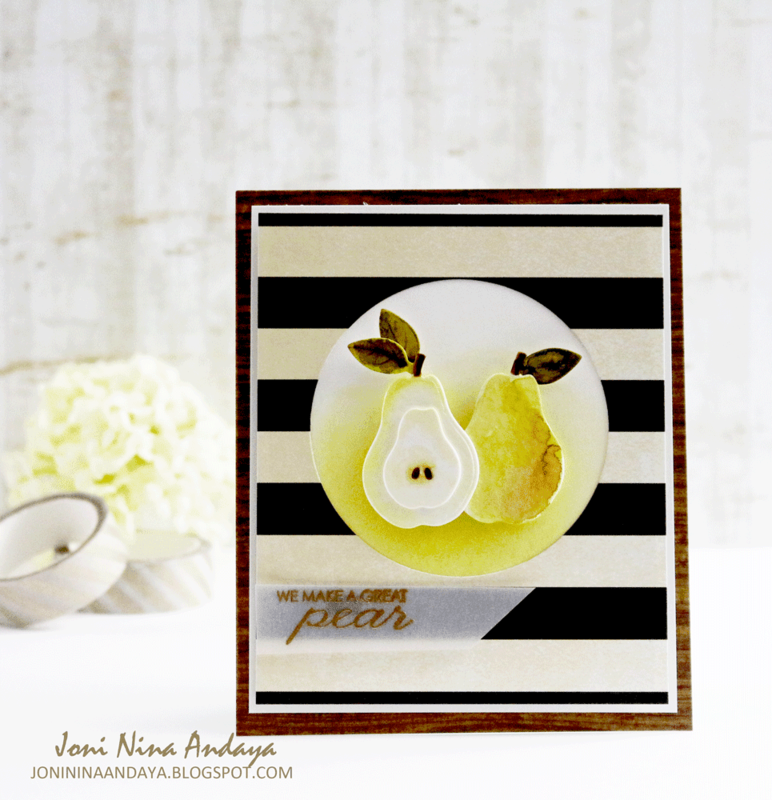 LOVE, LOVE your watercolour pear Join! So glad you joined in the fun @ FUSION! Awesome love those stripes and focal peaches :) thank you for sharing with Fusion ! This card has the WOW! 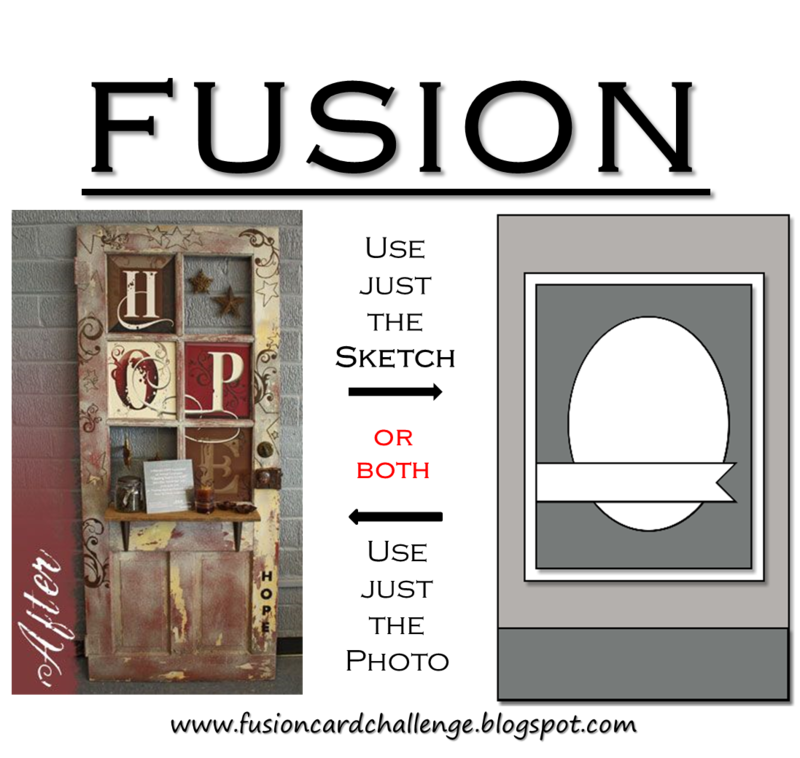 factor in both design and colors. Kudos to you and your awesome paper crafting talents!